908 international students from 53 countries. 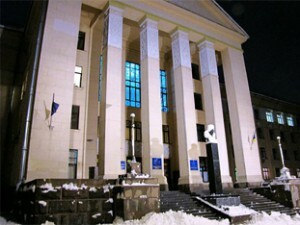 58 Honoured scientists of Ukraine, Honoured Physicians of Ukraine. 2 computer reading halls with internet access. International cooperation in educational and scientific spheres is maintained with WHO, 32 world and European Academies, Professional Associations and leading Universities worldwide. 21 international delegation visits within the last 5 years. In accordance with the resolution of the Cabinet of Ministers N 1238 from 5 of August 1998, with the National medical university Rector’s orders were adopted following standingorder of entering the university by the foreign citizens .